of contrast, now does it? 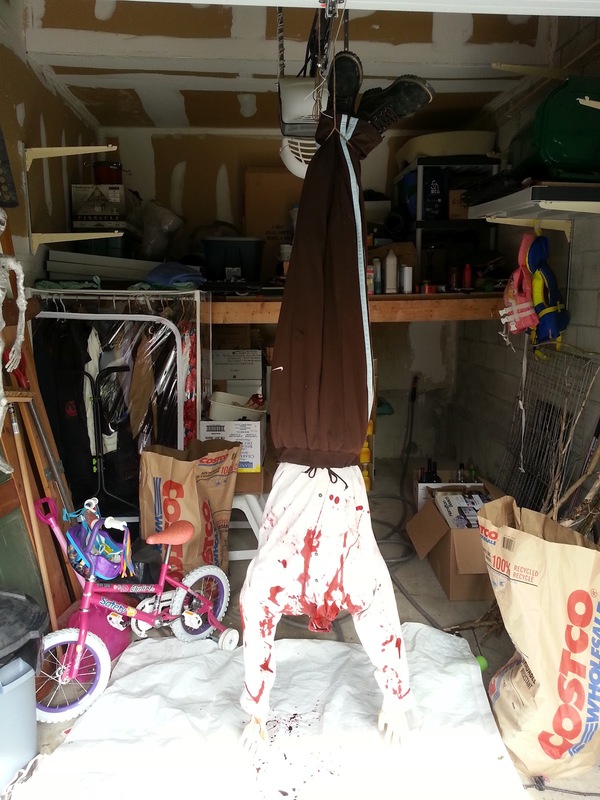 This Halloween we will have a serial killer haunt in our garage, the centrepiece of which will be the headless guy. Here's how he got made. 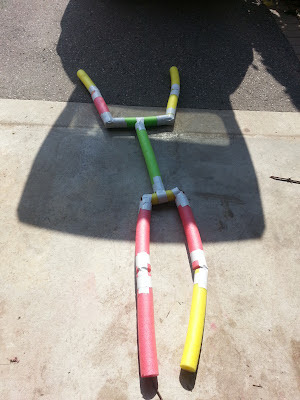 I started with constructing the skeleton from three pool noodles. Using a sharp knife, I cut them to size (I eye-balled the measurements), and using duct tape to assemble it. 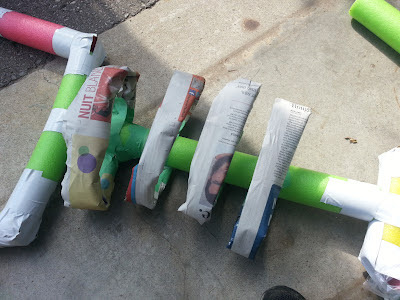 I made sure to leave some room between the upper and lower arm sections, and between the thighs and shins, so as to give the knee and elbow joints some play. As you can see, I didn't bother with a head, as I intend for that to be found elsewhere. As I want this guy to be suspended up side down from the ceiling, I made his arms point upwards. That's trial and error right there. Not exactly anatomically correct, but it'll do. The rib cage was constructed by rolling up newspaper, bending it to shape, and attaching it to the spine with tape. Masking tape works just fine. That's a body right there. To give the guy some bulk, I used newspaper crumpled up lengthwise. 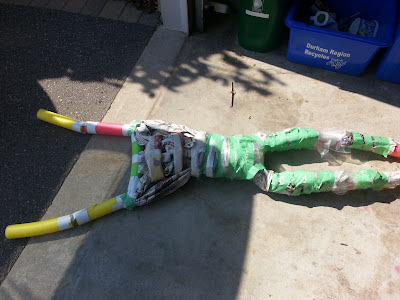 First I filled the rib cage, then I attached some paper to his thighs and the back of his lower legs. 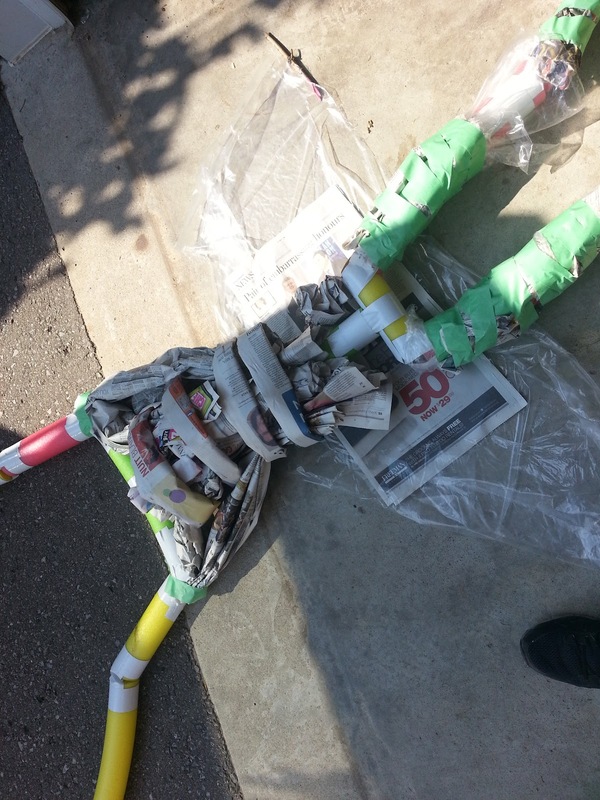 Then I tucked some paper into the second and third rib from the top, and attached it to the shoulders. As you can see, I tried using plastic to wrap the paper, but I quickly abandoned this method. He'll be hanging in a dry spot, so this didn't make much sense. For an outside prop, this may be worth carrying out. That right one is the cheap one. Can you tell? After getting him dressed, I attached his hands. 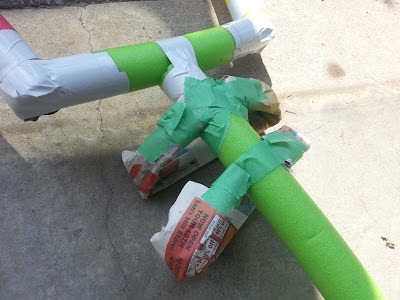 I did this by first taping sections of pool noodle to the prefab props to give them the proper length, then I attached them in the same manner as the other joints. Now, I could just as easily have done this in Step 1, but as I was making this up as I went I didn't think this far ahead. I do love that knife. The feet were made using sections of pool noodle. Here I cut of a little wedge at the back of the bottom part of the legs to give the feet a bit of an angle. Then I tied his shoes on just like you would normally. 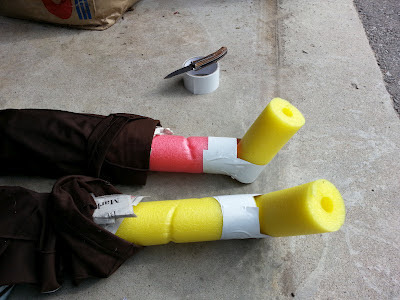 One thing I will change before the haunt goes up is to insert rods (I'll probably just use twigs or something similar) into his shins to stop them from bending where the rope cinches them together. 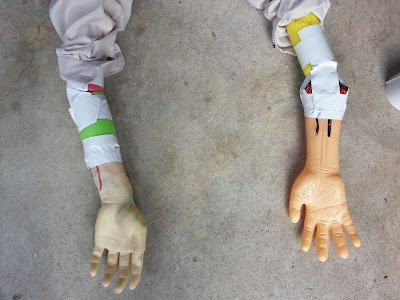 As you can see from the first image, I've doused him in blood already, but when he goes up for Halloween, I will splatter him thoroughly, and place a blood-filled tub underneath him. This method leaves plenty of room for improvement, but it is a good starting point. Next year I'll probably have a few more, and I may even try to tackle a head. The corpse juxtaposed with the pink girl's bicycle is so funny! wow, this is nice. I wish I'd seen it sooner!